With the name of the producer, Guillermo del Toro, being more prominent in all the publicity and the actual director left to be second fiddle, you do wonder. This is another one of the “Well known director presents …” That normally means that the director has seen something that the director has done. 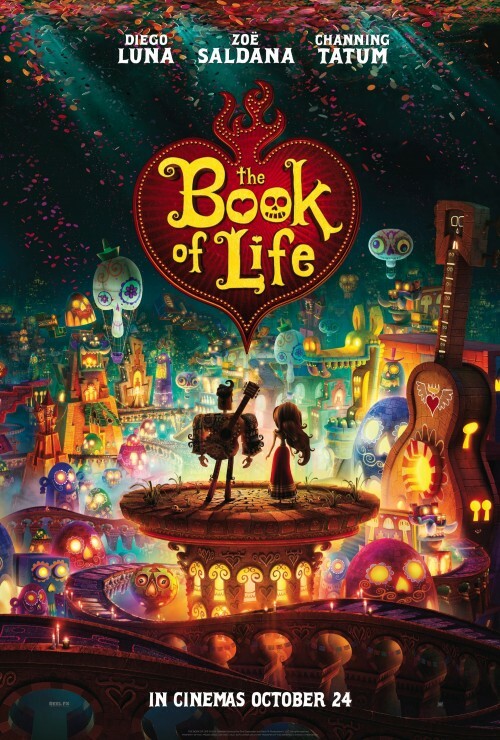 The Book of Life, seems to have a great cast but is lacking in cutting edge animation. It has the feel of a children’s cartoon. Simple shapes for the characters but it does mean that they can spend more money on the cast. This is what they have seems to have done. Even if one of the biggest names in the cast is one that always seems to be in Guillermo’s films. Ron Perlman & Danny Trejo. The other thing about the poster, the only image released so far, is two of the names are familiar. One is Uhuta from the current Star Trek films, Zoe Saldana, and the other, Channing Tatum is from G.I. Joe! The person who has top billing, Diego Luna, is best known for a film that came out 13 years ago. That being Y tu Mama Tambien. A relative unknown to English speaking audiences. Yes, he has been in English language films like The Terminal and Milk to great acclaim but not as well known as the English speaking cast. On the plus side, it does look like a great, fun, film that should draw you in even if the characters aren’t as well done as some. The style is familiar but I can’t just put my finger on the film that the style reminds me of.